Book early as all accommodation is limited and to ensure you get your first choice of hotel. Please remember that all of our prices are for full occupancy of twin/double rooms. 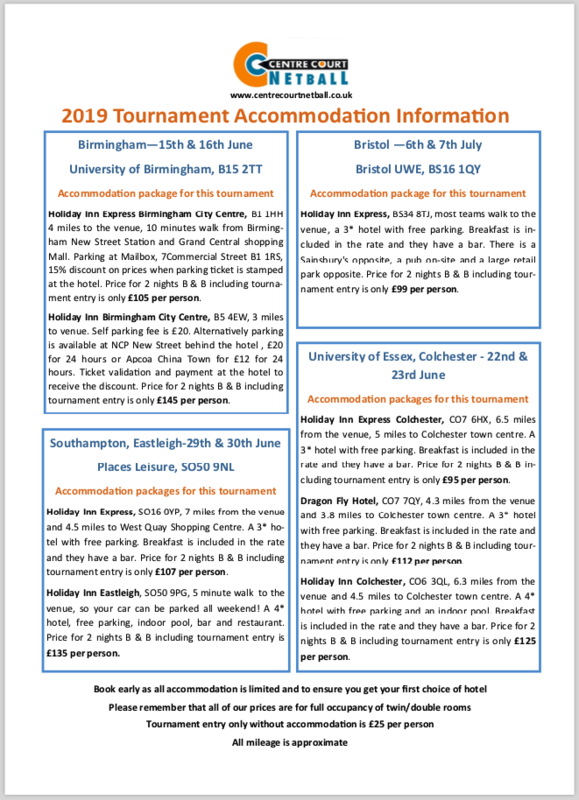 Tournament entry only without accommodation is £25 per person. Umpires can be provided at a cost of £70 per team. All mileage is approximate. All players must be over 16 years of age. £70 deposit per team is non-refundable. The final balance is due at least 8 weeks before the tournament. If the tournament is cancelled by the organisers a full refund will be given. A final invoice will be sent to you 2 weeks before payment due date, please complete this with player names and return with your final payment. Cancellation to be put in writing to info@centrecourtnetball.co.uk 12 weeks before the tournament, otherwise the full balance is due.